The season of Thanksgiving is upon us, and we must say, thankfulness is contagious. The end of each year is filled with planning for the upcoming year and reflecting on what happened throughout the current year. We stepped away from planning an exciting 2019 to write a list of what we are thankful for. Stressors that have morphed into silver linings. Owning a business has its ups and downs. One day, you’re on top of the world. You could have landed a coveted account or knocked an event out of the park. Or you could feel the lowest of lows when someone questions your work or when a client decides to go with another option for communications needs. One of our core values is resilience, so no matter what happens #behindthehourglass, we keep on going. Positive and negative events are all silver linings that help Hourglass Media grow as a company. Overcoming barriers also goes hand in hand with resilience and silver linings. We are thankful for opportunities to grow and overcome barriers. The beginnings of Hourglass Media were full of hurdles to jump over, from learning which financial software to use to which sales taxes to file within the state of West Virginia. We also help clients overcome their own communications barriers with the help of an RPIE (Research/Planning/Implementation/Evaluation) strategic plan. Learning is at the heart of what we do. If we aren’t learning as a company, that means we are remaining stagnant within the PR profession and as a company. That is unacceptable to us! Our company culture is one of learning, whether it’s combing through a Public Relations Society of America (PRSA) article or participating in a three-day conference. Learning keeps our skill sets fresh. We value each client and partnership. After all, we couldn’t exist without the support of so many clients and partners throughout our local community and online. In essence, they keep our PR world spinning and our minds constantly on alert. We love our Hourglass Media family and treasure the relationships. Away from the office, we also have our own support networks that keep us going on good and bad days. Being able to work from anywhere is pretty amazing. We can work in our headquarters, in a local coffee shop, halfway across the world. The possibilities are endless as long as a wifi connection is available. We are a family-oriented company, too, so taking some time away from the office to spend time with loved ones is vital to our core mission and in order to regroup when all of the work is done. From the art deco influences in our logo and other branding materials to the graphic tees we wear in the office, we love everything vintage. We’re thankful for “Star Wars” references, literary quotes and classic red lipstick shades. Having a passion and doing meaningful work. Being passionate about our work and causes is the driving force of Hourglass Media. Without it, we would go through the motions. Each number on an invoice, phone call with a client, meeting with a community group and presentation with the PR leaders of tomorrow would be in vain. Without passion, it wouldn’t have the same ring to it. It’s what separates us from others and keeps our business honest. We love helping others and doing meaningful work that actually makes a difference in people’s lives. We try our best to be objective rather than subjective. We are thankful for our strengths and successes, but we also appreciate our weaknesses and failures. In fact, we learn more from our failures than from successes in some instances. 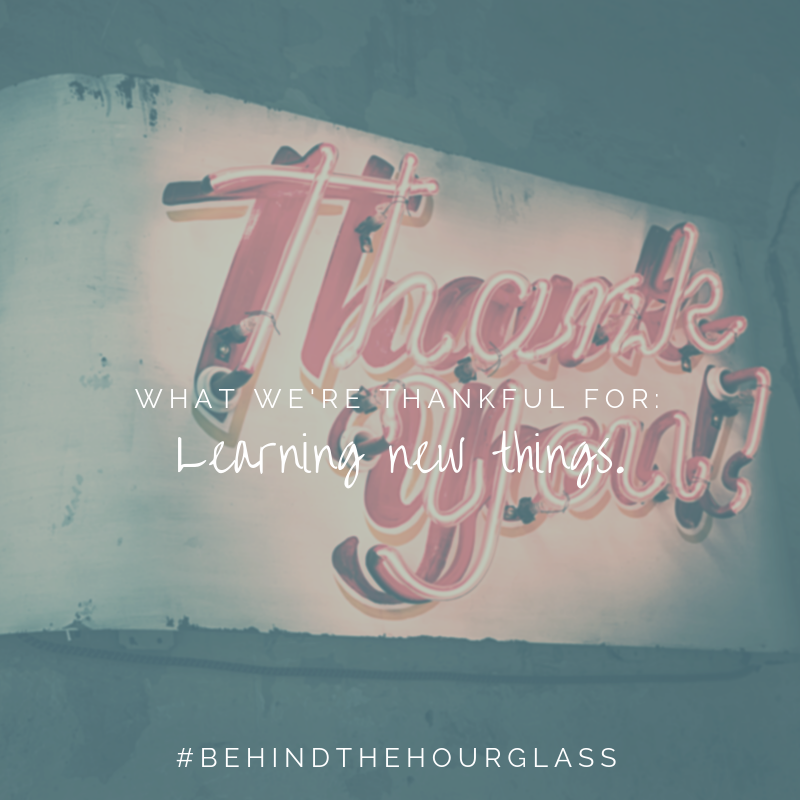 So, we’re thankful for honesty, strategic planning and second chances. There’s nothing like being in a creative field. Creativity is a blessing because we are able to invest our time in words, graphics, photographs and narratives. We love every minute of telling stories, whether they are our own or others’ stories. We would be remiss to not mention coffee. Each work day is sponsored by Colombian coffee with a dash of sugar-free creamer. We give thanks to the coffee beans that keep our brains fresh and the ideas flowing.